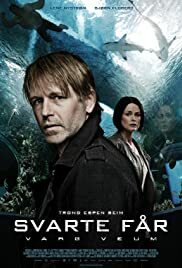 Murder and trouble hits Veum when he meets up with classmates in the rock-band Camp, when he resumes contact with a former flame Rebecca, now wife of his buddy. A Varg Veum mystery by best-selling crime novel by Gunnar Staalesen. Staalesen. This movie allows to get to know Karin. Or at least this was the attempt. Karin's mother is dying and her last wish is to meet with Karin's younger sister, Siren (Kjærsti Skjelndal), which ran away from home as a teenager. For Varg this time gap is no problem and soon he tracks Siren down. Apparently, she is involved in a murder and is surrounded by mafia. We see few incredibly unnecessary scenes, but in the end this is one of the best movies in the set. Back to this attempt of getting to know Karin. The movie had a potential to do that, but it was blown away. She is hidden in Varg's shadow, despite the fact that now she is the second most important character. On the other hand, male characters are nicely surprising, cause although the plot is based on women, men conduct all the actions.